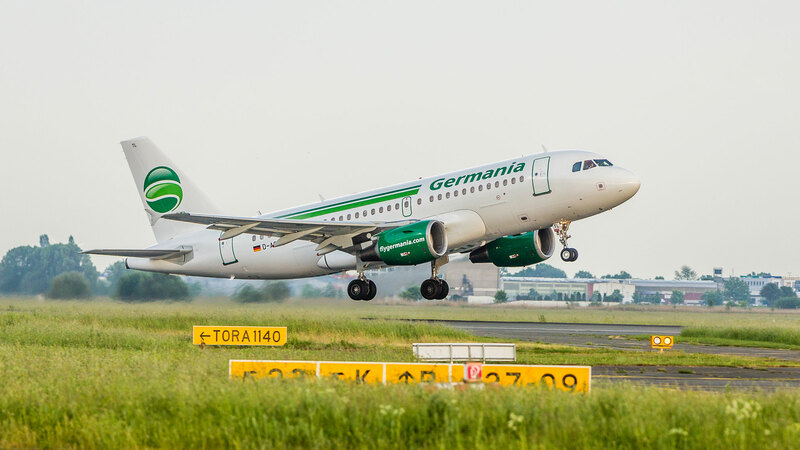 The German civil aviation authority Luftfahrt-Bundesamt today revoked the operating license of Germania Fluggesellschaft after the company filed for insolvency and ceased flight operations in the night between February 4 and February 5. The Berlin-based leisure carrier blamed “unforeseeable events” such as the increases in fuel prices last summer and the simultaneous weakening of the euro against the U.S. dollar, as well as “considerable delays” in phasing aircraft into the fleet and an “unusually high number” of maintenance events for its short-term liquidity need. The company could not be reached by AIN to comment on the nature of the aircraft delays, though they are unrelated to its outstanding order with Airbus for 25 A320neos as deliveries were due to start only in January 2020. At an event at Airbus in Hamburg in March last year, Germania CEO Karsten Balke described Germania's investment in the new aircraft and the fleet standardization as the “most extensive modernization program” in the airline's 30-year history. The insolvency covers the airline and its sister maintenance company, Germania Technik Brandenburg, as well as Germania Flugdienste. Its Swiss carrier Germania Flug and Sofia-based Bulgarian Eagle have not been affected. Germania flew some 4 million passengers per year on short- and medium-haul flights from 18 departure airports in Europe to more than 60 destinations within the continent, in North Africa, and the Middle East. Its business model combined scheduled, charter, and ad hoc flights. Together with Bulgarian Eagle and the Germania Flug, Germania operated a fleet of 37 aircraft, mostly A319s. Germania's bankruptcy filing is the latest in a series of airline failures across Europe in recent months, including Primera Air, VLM in Belgium, Cobalt in Cyprus, SkyWorks in Switzerland, and Small Planet Airlines. Ryanair CEO Michael O’Leary, speaking to analysts on the company’s third-quarter results call on Monday, said he expects more closures and airline failures in 2019 due to overcapacity in the European market, which is causing continued fare weakness. There is “idiotic loss-making capacity out there in the marketplace,” he said, warning that the excess capacity will persist in the summer unless there is a more meaningful take out of short-haul capacity.